When Orwell went to England in the 30's to find out how industrial workers lived, he not only observed but shared in their experiences. He stayed in cramped, dreary lodgings and subsisted on the scant, cheerless diet of the poor. He went down into the coal mines and walked crouching, as the miners did, through a one- to three-mile passage too low to stand up in. He watched the back-breaking, dangerous labor of men whose net pay then averaged $575 a year. In The Idiot, Prince Myshkin possesses a childlike innocence and trusting nature that leave him vulnerable to abuse by those around him. Returning to St. Petersburg to collect an inheritance, Myshkin realizes he is a stranger in a society obsessed with wealth, manipulation and power. The big issue (as you can see from other reviews) in the narrator. For the first hour or so, until it became familiar, it was distracting and excruciating -- the narration sounded very upper class British, snobbish, bored and just a little bit peeved to be telling the story. Also, there is a sing-song quality to the intonations, and some of the intonation patterns are repeated to the point where familiarity becomes a bit tedious. Oddly enough, when the narrator does characters, these problems all disappear and the voices sound appropriate for the persons portrayed. But then he switches back to the "narrator" voice, which doesn't sound at all like one of the Karamazovs' neighbors. I've never been a huge fan of Russian literature, and this book reminded me why. 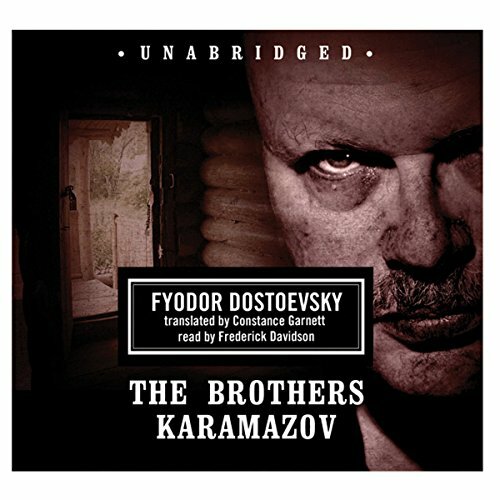 The Brothers Karamazov isn't so much a story as a lengthy disquisition on the Russian character and the issues of Dostoyevsky's day, detailed personality profiles, and digressions on every subject Dostoyevsky wanted to pursue, including free will, the existence of God, moral responsibility, and truth. It's a high-minded novel full of weighty intellectual themes and I could not help but appreciate the meticulous detail with which the author constructed every part of it from the events and familial and romantic relationships leading up to Fyodor Pavlovich Karamazov's murder to the background histories of even the most minor characters. The problem is, Dostoyevsky spends entire chapters on things like the background histories of the most minor character. Half the book was one of the Karamazovs talking on and on uninterrupted to an audience as silent and passive as the reader/listener. The skill of the author cannot be denied. The style is completely unlike modern literature, but Dostoyevsky makes every one of his characters so complex and complete that you wish more modern authors were as thorough (and indulged as much by their editors) in their creations. And you can sense the majesty of what Dostoyevsky was trying to accomplish -- he takes a bunch of different arguments and picks them apart from multiple points of view, letting the Karamazov brothers or secondary characters or even allegorical figures hash out everything the author is thinking (or arguing against) thoroughly and articulately. So I guess that's a lot of words to say "It's Literature." I don't really feel anyone should force themselves to read books that don't interest them, but there is something to be said for knowing the books and the authors who influenced other great authors. That said, I can't exactly say this was a "fun" book, but you'll be glad you listened to it. The narration of this classic book is both fluid [which is no small feat with all those Russian names!] and entertaining. A wonderful study and description of human nature as well as the idea that without God there is no moral foundation [or restraint] attending human actions. Highly recommended. My take is that this narrator is actually quite incredible. Much of the book is dialogue and I am amazed at the way the narrator jumps between characters - male, female, old, young, wise, foolish, etc - so effortlessly. In fact, he is able to maintain the tone and personality of the character with precision. The story is long and I greatly appreciated the narration. Listen to the sample and you will see what I mean. What would have made The Brothers Karamazov better? A narrator who understands Dostoevsky. Narration requires interpretation, and Davidson has it all wrong. Zossima is the central character of the novel, the one who carries Dostoevsky's message. Unfortunately, Davidson makes him come across like an evil troll. What didn’t you like about Frederick Davidson’s performance? He can't pronounce Russian names. They're not that difficult. I think most people know that EEEvan is not the way to say the common Russian name Ivan, and stresses are misplaced in most of the other names as well. But that's a common problem with narration of Russian novels. Worse is the droning, sing-song, nasal voice. The narration ruined the book for me. In the list of books narrated by Davidson there are several I am interested in, but I will never order a book narrated by him again. 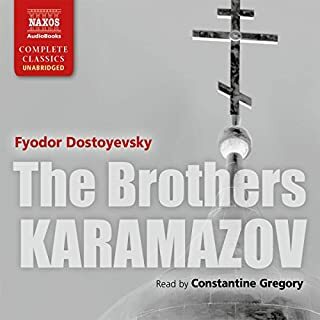 If you could play editor, what scene or scenes would you have cut from The Brothers Karamazov? None. Everything is necessary to Dostoevsky's message. There are only three unabridged versions offered by Audible. The Magarshack translation is unreliable, so that left only the Covell and Davidson narrations. In the sample provided, Covell mispronounces every Russian name and according to other reviewers, his narration is flat and uninspired, so I was forced to put up with Davidson. Clearly it's time for a new recording. 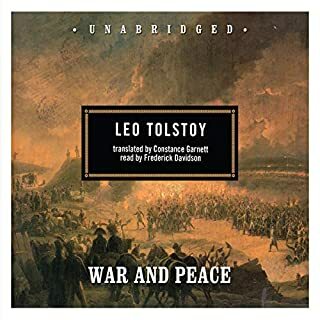 This is my favorite novel of all time, and unfortunately, the first book from Audible that I have been totally disappointed in. By the way, translators should always be identified along with the authors. It makes a difference. The reader did an excellent job of differentiating the characters. My only quibble is that he frequently placed the accent on the wrong syllable in the patronymics. This is an interesting story involving passionate characters that become absolutely vivid through the narration. The narrator switches between accents so seemlessly, you know who is speaking without being told. Wonderful story and very touching ending. I would suggest pulling up cast of characters on Wikipedia and writing down the various nicknames each character has or you may get confused in the beginning. I would not have enjoyed the book one tenth as much as the audible version, as the narrator had such a good sense of the character of each person in the story and really illustrated said character through his narration. 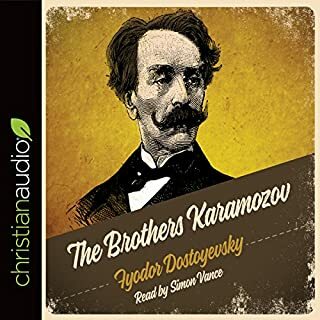 Where does The Brothers Karamazov rank among all the audiobooks you’ve listened to so far? One of the best, for me. Some others had a problem with the narrator, but I have to disagree. To be honest, it is one of the best narration jobs I've heard on any audiobook. For me, the wonderful english accent and rough voice perfectly enhanced the world I believe Dostoyevski is trying to create in this novel. I have to rate this one of the best audiobooks due to the combination of a wonderful novel and brilliant narration. What other book might you compare The Brothers Karamazov to and why? 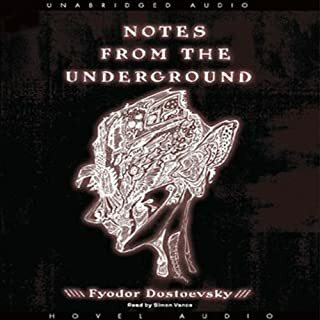 Like all of Dostoyevski's books, you get a certain "feel" when reading/listening. So I compare all of them especially concerning the characters. I love the scenes in the Monastary at the begginning of the book.....I can almost see papa Karamazov's contorted face when I listen to Mr Davidson belt out his dialogue ...wonderful! Hard to have the time to listen in one sitting, but even with the length of this, it was one of the fastest I've gone through. Every so often, you hear a narration that takes a good novel to new heights....this is one of them. Bravo Mr Davidson. After listening to over a hundred audio books, I've finally found a narration I just can't get past. Imagine a British Mr. Garrison from Southpark droning on with a stuffy nose. It takes way too much conscious effort to hear the words through the narrators annoying accent. My violent hatred of this narration grew every time I had to rewind the book. Great story. It's portable - so the audiobook format works - I'd choose a different narrator however. I found the narrator somewhat haughty and self absorbed, with little 'character' or expressiveness to his efforts. The voicing of different characters was undifferentiated and therefore kind of hard to distinguish between. The problem was NOT the english accent but more his manner. If this were a book I would prefer to read it. The reader pauses all wrongly and has a very supercilious voice. Had to abandon listening it was driving me mad. 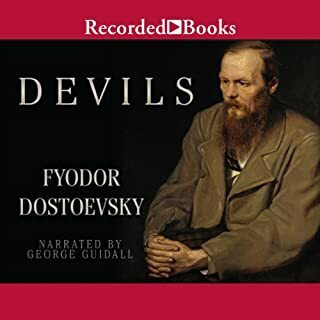 If you’ve listened to books by Fyodor Dostoevsky and Constance Garnett (translator) before, how does this one compare? 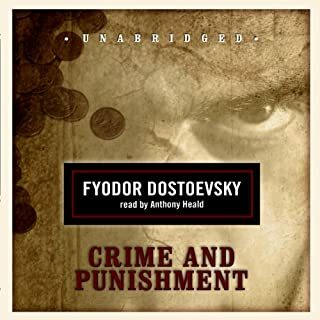 I have listened to Crime and Punishment and The Idiot and would have persisted with thirty plus hours more of Dostoevsky's finest but sadly the awful narration failed to bring this book to life for me. The narration was really poor.